Cabinet minister Miri Regev presents logo for the commemorations, alluding to King David, the 6 Day War, and even songwriter Naomi Shemer. Culture Minister Miri Regev was greeted with accolades and joy at the Cabinet meeting in Jerusalem this morning when she presented the ministers with the official logo of the celebrations for the upcoming 50th anniversary of the reunification of Jerusalem. This coming June will mark 50 years since the historic and dramatic battles of the Six Day War in which Jerusalem was miraculously reunited. Israel's joy is not widely shared; the nations of the world stand apathetically by as the Arab world refuses to accept the Jewish Nation's historic and religious links with the Holy City. Regev, a former IDF Spokesperson, explained the new logo, which is based around the number 50: "It explains the true story of Yerushalayim. The basis of the digit 5 is a harp, reminiscent of David, King of Israel, who founded Jerusalem as our eternal capital 3,000 years ago. The head of the 5 is a lion – the symbol of the modern city of Jerusalem." She added that the number 5 is also reminiscent of Paratroopers Battalion 55, "which was the first to enter Lions Gate in 1967 and was the IDF force that liberated Jerusalem." Continuing the explanation, Minister Regev said that inside the digit 0 the flag of Israel fluttering above the walls of Jerusalem, the Western Wall, and the Temple Mount can be seen – as it did for the first time in history in 1967. The color of the logo is gold, "like the near-prophetic song of Naomi Shemer, Yerushalayim Shel Zahav, 'Jerusalem of Gold.'" The song was first composed and performed before the Six Day War, after having been written with longing for the parts of Jerusalem then under unrecognized Jordanian control. After the Six Day War, Shemer added a verse reflecting the new reality of united Jerusalem under Israeli control. Under the drawing appear the words, "50 Years to the Liberation of Jerusalem: United and Uniting Jerusalem." Regev related to the criticism some expressed of the word "liberation:"
"The fact that Jerusalem was liberated [in 1967] should be above all political dispute. I saw some of the reactions to my insistence on the use of this word, and I was very saddened. I am most regretful of any Israeli, right or left, who is bothered by this. The Jewish Nation's bonds to Jerusalem are perhaps the deepest there have ever been in history between a people and a city. If we are not able to tell ourselves that we have liberated Jerusalem from generations of foreign conquest, then how can we complain against the rest of the world for not recognizing our bonds with it?!" She concluded by saying, "It is a great privilege to merit being part of the generation that sees this great wonder before its very eyes – the Jewish Nation living in Yerushalayim. 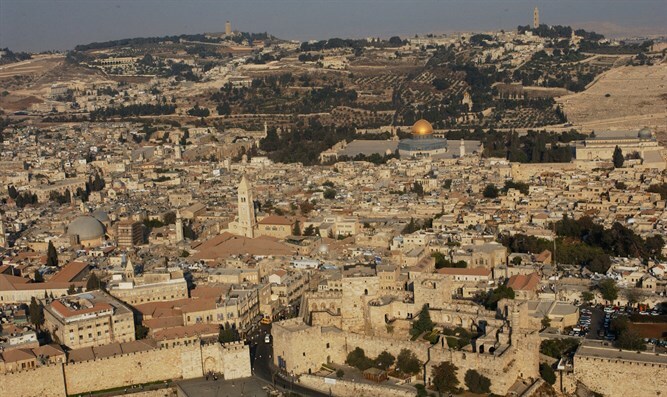 The People of Israel are building Jerusalem, and we will continue to do so for many years."